From simple to complex needs, we’re here for you. 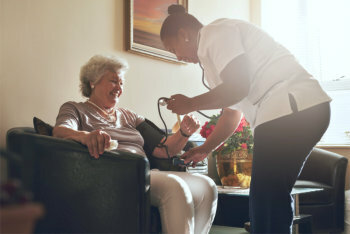 Elite Home Care recognizes that you or your loved ones may require skilled medical care for certain conditions brought by age, chronic illnesses, or any acute medical condition. Our Registered Nurses and Licensed Practical Nurses are highly trained and qualified to render skilled nursing care in the clients’ home. Their role of care is vital for the recovery of individuals who are facing long-term chronic illness or have had a short-term surgical procedure. Our nursing staff stands ready to help patients return to their original well-being by providing comprehensive and compassionate skilled nursing care. If your family member is confined to bed, our Personal Support Program provides trach care, tube feeding, diaper changes, and repositioning. For further inquiries, do not hesitate to reach us. You are also welcome to set an appointment with us at your convenience.